Every one would like a boost on their happiness scale! This goes double for those with FM, chronic pain sufferers, and other painful diseases. Of course we need to choose wisely and lean toward something natural. I encourage you to find natural supplements that increase your hormones and happiness! When mixed correctly, dopamine, serotonin and norepinephrine appear to work like a happiness cocktail. These monoamine neurotransmitters are naturally produced in the human body. The brain releases and regulates monoamines that have long been surmised to play a vital role in cognition, emotion and arousal. Research is ongoing on drugs that enhance the effects of monoamines, commonly used as therapeutics for anxiety and depression. Studies are aimed at identifying their effect on behavior and mood. In the 1960s, the late Dr. Joseph J. Schildkraut, a Harvard psychiatrist, who studied antidepressants and their influence on brain chemistry believed norepinephrine the causal factor for depression. He played an influential role in establishing the deficiency of norepinephrine as a biological basis for depression and that an excess leads to mania. 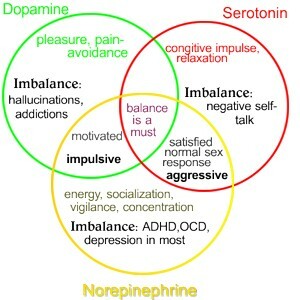 As well as a neurotransmitter, norepinephrine is one of the hormones that help increase happiness. It is the precursor of epinephrine a.k.a. adrenaline. Working in concert, they are responsible for our response to stress, or emotional and physical reaction, to fight-or-flight. The heart rate increases and glucose is drawn from stored energy. It has been determined that serotonin is another factor interacting with norepinephrine to trigger depression. Selective Reuptake Inhibitors (SSRIs) are thought to increase serotonin by restraining its reuptake into the presynaptic cells. However, serotonin research has been ongoing since a group of researchers at the University of North Carolina at Chapel Hill presented their “permissive hypothesis”, some 30 years ago. Their contention was that synaptic exhaustion of serotonin by “permitting” decreased levels of norepinephrine contributed to depression. Suppositions that serotonin levels could be maneuvered, thus heightening levels of norepinephrine in a roundabout way, kept norepinephrine in the loop as a chief cause of depression. For example, antidepressants such as venlafaxine (Effexor) affect serotonin and norepinephrine levels in the brain to help us feel safe and heighten self-confidence. Earlier antidepressants, known as tricyclics, also block reuptake of serotonin and norepinephrine. Although effective, they have more side-effects. Tricyclics are still prescribed for people with depression when other drugs have been unsuccessful. Dopamine completes the triad of substances that relieve depression. This neurotransmitter is crucial for movement control and is responsible for the pleasure and reward centers in our brain. It is thought to release endorphins that permit us to feel pleasure. Dopamine stimulates circulation, metabolism rate and the heart. Further, dopamine makes it possible for us to make progress in obtaining rewards. A deficiency leads to Parkinson’s disease. Agents that selectively target dopamine are fast acting, but some of its properties have restricted their use in comparison with other antidepressants. This neurotransmitter is linked with addiction. Drugs such as alcohol, cocaine and opiates stimulate dopamine production. As you can see, serotonin, dopamine and norepinephrine are important hormones that help increase our happiness. Apparently, disruptions in their levels affect our emotional health in an adverse manner when they are combined correctly in the body to meet normal requirements, like grief and stress. Unfortunately, aging, chronic stress or unresolved grief, plus environmental factors impede the production of these necessary neurotransmitters and hormones. Like all synthetic drugs, antidepressants have unpleasant side-effects. To assist the brain’s production of serotonin, dopamine and norepinephrine, our diet is the most natural place to start. A general rule is that a protein rich diet boosts dopamine and norepinephrine levels. Carbohydrates activate the release of serotonin. Tyrosine is the precursor of norepinephrine. Shrimp, tuna, lobster, pork roast and chicken are all rich in tyrosine. Turkey contains the highest content. Milk, cheese and yogurt contain significant amounts of tyrosine. Lima beans, avocados, pumpkin seeds and bananas are good sources as well. While you may need to acquire a taste for them, banana peels provide a generous amount of both dopamine and norepinephrine. Ginseng root prevents the depletion of stress fighting hormones and increases production of norepinephrine. The amino acid L-Tyrosine and the herbal, St. John’s Wort are natural supplements that raise levels of norepinephrine. Researchers suspect that loud music and unpleasant sounds, such as high frequency computer noise, can trigger your body’s fight-or-flight response. Because your body senses danger, it produces excessive norepinephrine hormone and adrenaline. This is not good. We recommend everyone learn to balance their stress levels. For sounds that can’t be eliminated, try masking them with soft, soothing music. Nature sounds or a white noise machine can also block out unpleasant noises. Poor nutrition, stress and antidepressants can deplete dopamine levels. Good sources of dopamine are bananas, avocados, artichokes, dairy products, lima beans, sesame and pumpkin seeds and almonds. Beets contribute betaine, an amino acid that helps regulate production of dopamine. Protein is rich in amino acids needed for dopamine production. Red meat, eggs, fish and turkey are broken down in the body to attain dopamine-related amino acids. Research shows fava beans and soy beans are excellent sources of dopamine and that increasing your intake improves libido. Simple sugars, refined foods and saturated fats impede correct brain function and can result in low levels of dopamine. Fish oil contains healthy omega-3 fatty acids, DHA and EPA, which can enhance the production of dopamine by 40%! Ginkgo increases oxygen and blood flow to the brain and encourages dopamine production. There is a feel-good reason we love our brownies and other pastries; they increase serotonin levels to boost our mood. However, the mood lift is only temporary. Soon, we crash, which leads to low blood sugar levels that release insulin and adrenaline. This compromises serotonin production. Therefore, it’s prudent to partake of slow carbs such as those contained in whole grains and oatmeal. They are rich in tryptophan, the amino acid that the body converts into serotonin. A good vitamin B complex helps the body create serotonin. St. John’s Wort or fish oil also enhance production of serotonin. Rhodiola has the ability to balance dopamine, serotonin, and norepinephrine, at a good price.